Over the millennia, our cormorant went from a flyer to a swimmer. When flying did not fulfill its need for food and mobility, it found a better means of survival – waddling and swimming. 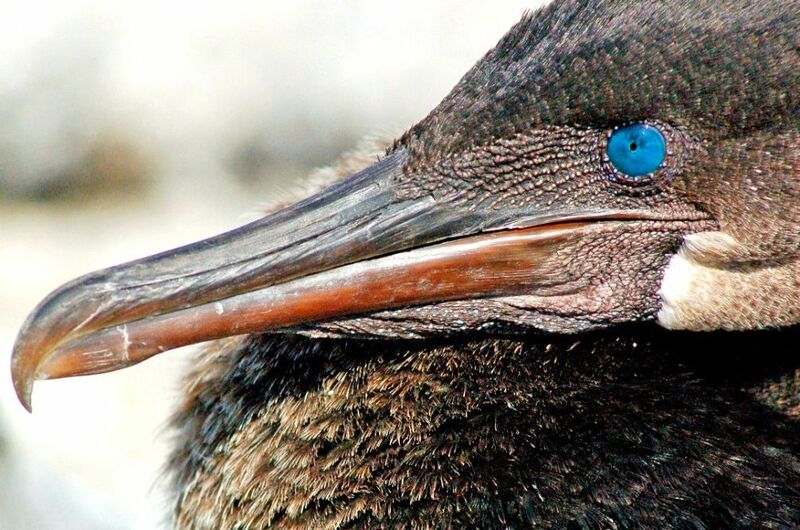 It became the world’s only flightless Cormorant. 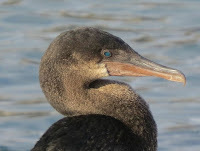 There are two likely causes for its adaptation: first, the cormorant does not need to go far for its food (within about 100 meters of the shoreline is all the nourishment it needs) and, second, it has no natural large land-based predators. It makes perfect sense when you think about it. Ask yourself this: "Why use all that energy to fly when you can stand around and take a short swim before returning for a little rest, a little breeding and more standing around in the sunshine?" Maybe you'd choose to adapt too! 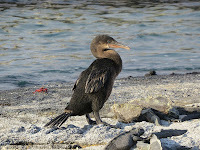 Of great interest to me is the fact that no flying cormorants remain anywhere in the Galapagos. Every single one of them became extinct, to be replaced by this bird that cannot fly, an anomaly in itself. And now, the flightless cormorant is at risk and considered “vulnerable” by the International Union for Conservation of Nature. This classification means that this rare and beautiful species is likely to become endangered unless the circumstances threatening its survival and reproduction improve. Consequently, though not at this time labeled as endangered, the flightless cormorant is the object of a thorough conservation effort here to regenerate the species. The species is so rare that there are only about 1500-1600 birds remaining throughout the archipelago, and those few live only on the shores of Fernandina and Isabela. They swim in the colder Cromwell and Humboldt Currents. To learn more about these currents and how they impact marine life in the Galapagos, visit my blog post. 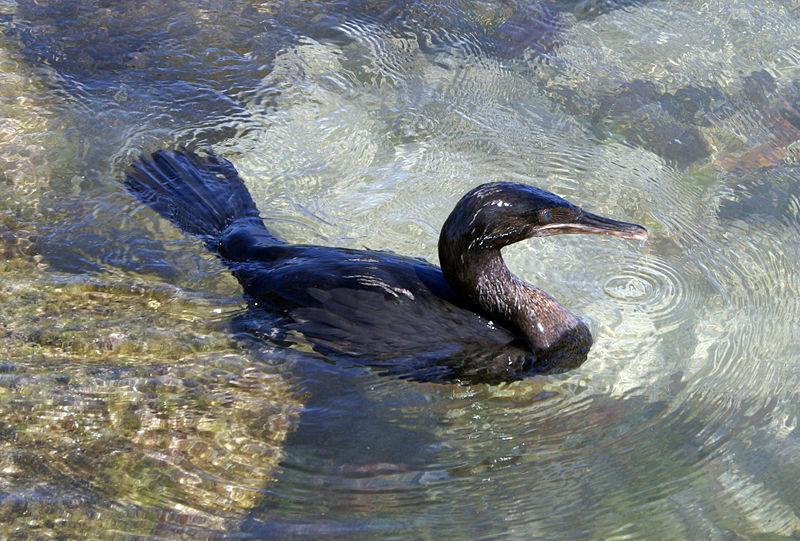 The physical adaptations to the bird’s body have occurred to make the cormorant an excellent swimmer and forager in the water. 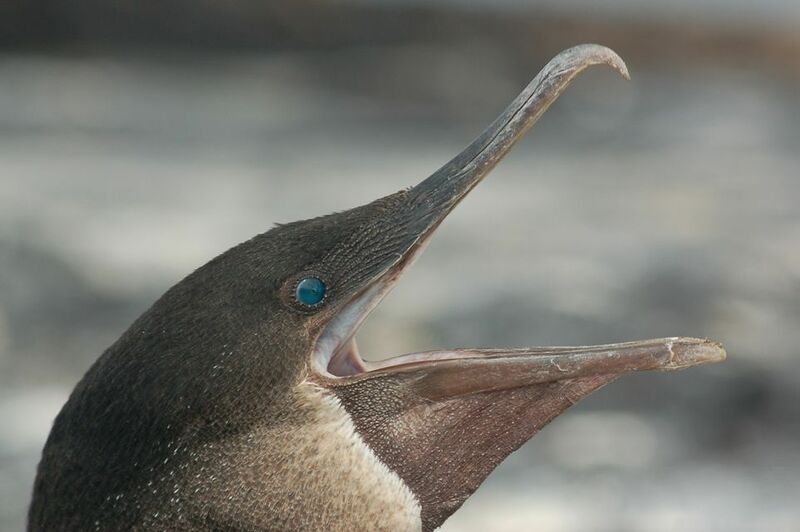 If you have read my post about the Galapagos penguin, you will recall that a penguin propels itself by using its front wings (fins) as paddles. 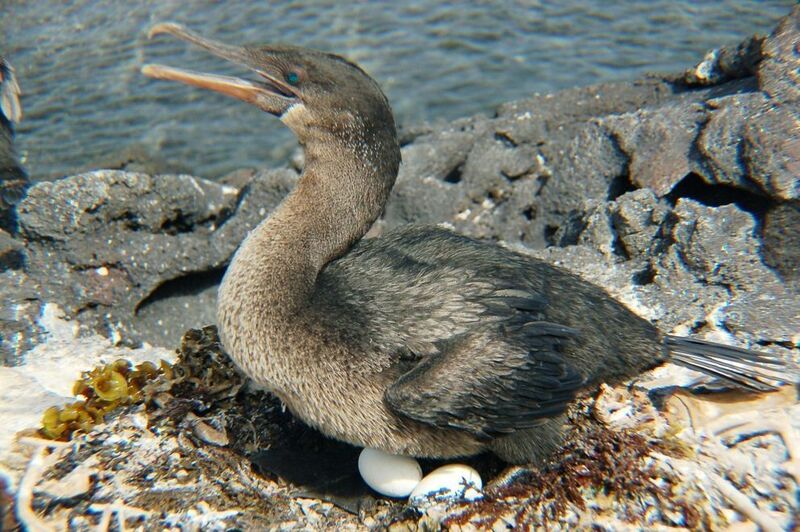 The cormorant, instead, uses powerful kicks of its legs, but its wings do little work at all. Most avians have a strong keel on their breastbone to support the relatively heavy muscles that birds need to fly and to support their wings. Unlike them, the flightless cormorant doesn’t need this heavy musculature because its wings are stunted – just about 1/3 the span and weight of typical bird wings. Instead, a flightless cormorant has substituted a heavy and powerful lower body for a strong upper body. With this power, the cormorant quite literally propels itself through the water by kicking its legs through the current. It’s particularly impressive to see a cormorant under water. It is very fast and appears to dart around searching for its prey. Its preferred diet consists of squid, octopus, eel and small fish. A weird aspect of flightless cormorant behavior is one that remained as a vestige of a time when the bird did fly. 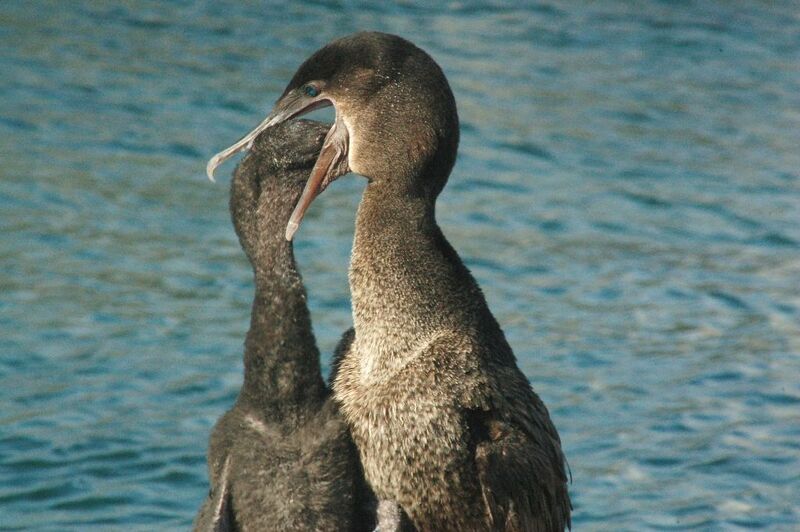 This particular behavior has not changed as the cormorant adapted to its peculiar Galapagos environment. All other species of cormorants feed underwater, even though they do not have waterproof wings. So, when any "typical" cormorant emerges from the water, before it takes off to fly again, it takes a break, opens its wings and air dries them. That makes sense if you are about to go on another flight across the ocean. But, why do that if all you’re going to do is jump back in the water for another swim? 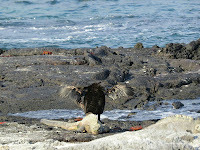 While there is no good answer for the question, it’s exactly what our Galapagos flightless cormorant continues to do. Often, you will see these guys with their scrawny wings outstretched drying in the air, a vestige of their earlier days of flight. On the other hand, the flightless cormorant’s body feathers are far more luxurious than those of the flying cormorant types. 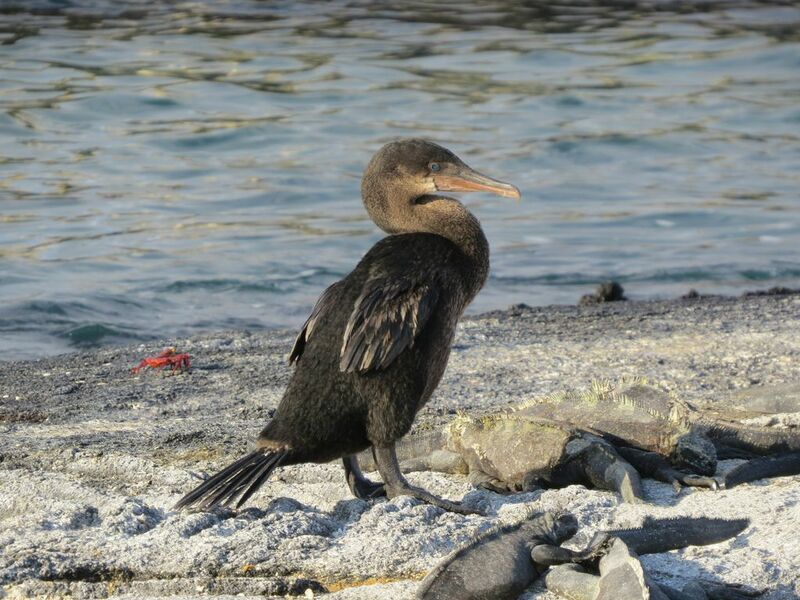 On the Galapagos Islands, the cormorants have thick, soft and dense body feathers to protect their bodies from the water and for buoyancy. When air gets trapped in their dense feathers, it helps them float, like a protective vest. 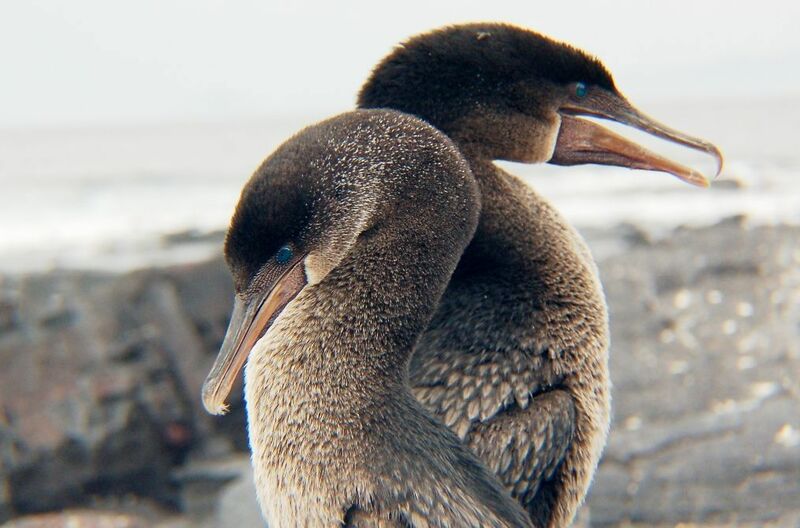 I’ve been fortunate enough to observe the complex and unique courtship ritual between a male and female flightless cormorant. It’s certainly a rare behavior to catch in progress, but fascinating and spell binding. Here is one of my favorite videos made available on You Tube by Galapagos Expeditions. It is not only beautiful, but rare footage of two flightless cormorants preparing a nest for their eggs. 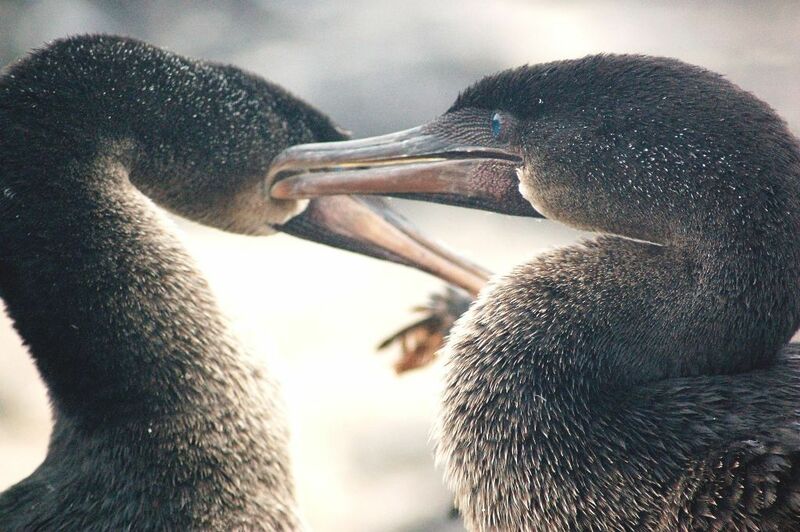 The courtship ritual and behavior of the flightless cormorant appears to us humans as tender and gentle. They seem to engage in a dance. The male brings gifts such as sticks and grasses to the female until she responds to his advances. Nesting takes place in July through October. The pattern begins in the water and then continues on the land. As you can see from the photographs, the birds have long graceful necks to help them reach their food source. 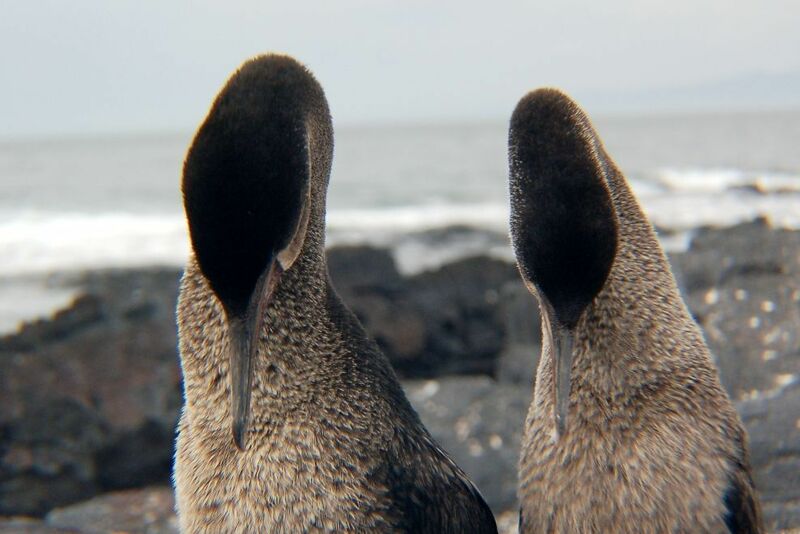 In the course of the mating ritual, they bend their necks in a snake-like “S” shape and swim around each other until the male leads the female onto the shore. The male will lead, and can be seen looking back at the female to assure that she is following him; all the time he is displaying his long neck. 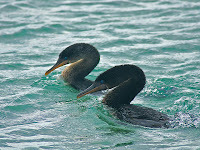 Together, the pair selects a spot on which to construct a nest, generally in a breeding colony consisting of about 12 cormorant pairs. They really are an industrious couple. The nest building project is undertaken by the male and female together. The male forages and brings back items to the female. She, in turn, incorporates the male’s offerings or “gifts” into the nest. Ultimately, the nest will consist of many types of natural materials such as sea weed, sea urchins, starfish, sticks and dead fish; sometimes unnatural elements such as bits of rope or other human garbage unfortunately get to be a part of a nest as well. 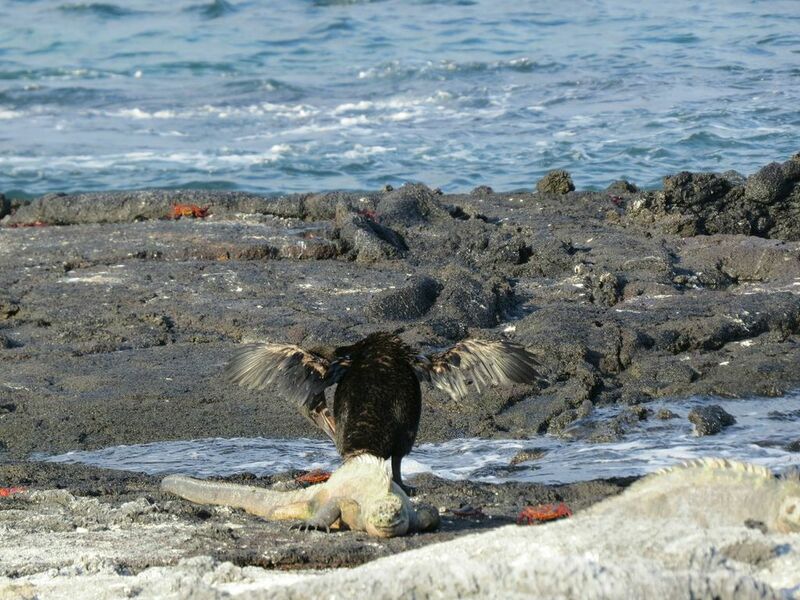 The flightless cormorant, like so much here in the Galapagos Islands, is unique and awe inspiring. This unique species of bird has not only a specific appearance, but also the other features. The cormorant managed to adapt to some changes in the environment.